Classic chocolate strawberries get a twist by adding mint chocolate and easy DIY chocolate letters that spell a custom message. This post contains affiliate links: if you buy something I’ll earn a small commission at no cost to you. 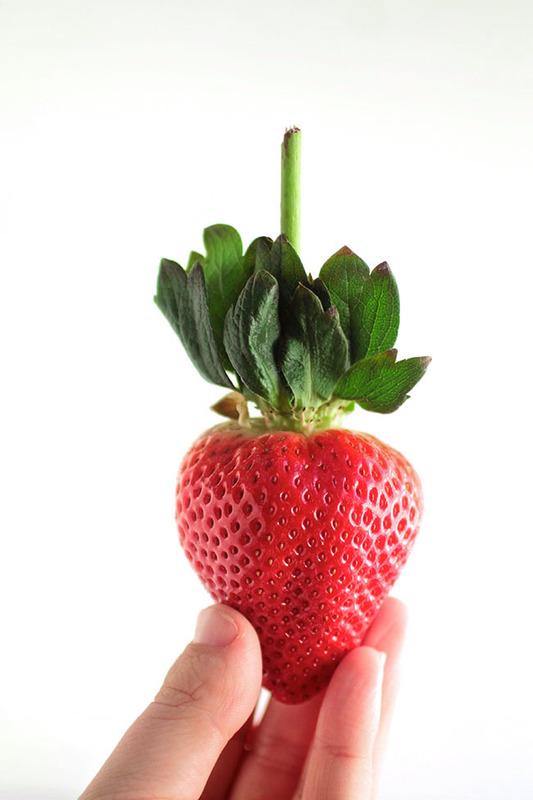 Thanks for supporting Life As A Strawberry! This post was sponsored by my friends at Driscoll’s. 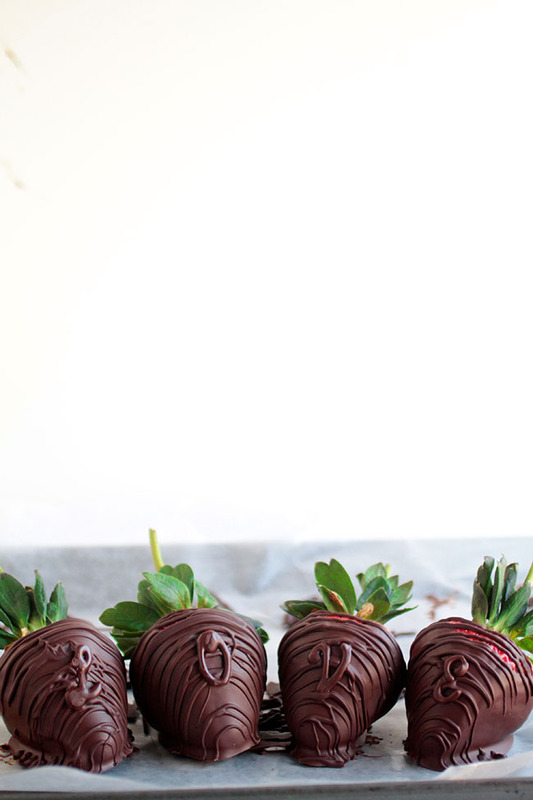 I think we can all agree that these chocolate covered strawberries are 100% ON. BRAND. It’s odd, I suppose, that I don’t share all that many strawberry recipes on this website. I think my problem is that I just love strawberries SO much I’m reluctant to do anything to them at all. Sure, I’ll make this amazing jam from time to time, and sure, I’ll dip them in chocolate. (Or in tequila). But 9 times out of 10 (okayyyyyyy, more like 9.99999 times out of 10) I just eat them. Right out of the container. But today, we’re getting ALL UP IN THAT STRAWBERRY BUSINESS with these strawberries (umm, WHAT blog are you reading again?) and also chocolate and then some MINT chocolate (whoa! a twist!) and then some fun drizzling/lettering action that’ll make everyone think you’re a regular ol’ chocolatier. I decided to stick with the classic combo of chocolate and strawberries, but I added some mint chocolate (I’m OBSESSED with these mint chocolate chips) to the mix for a flavorful twist without messing with the classic chocolate-covered strawberry look. Chocolate script letters (which are SO easy to make! I’ll show you) add just a touch of whimsy without caving to the whole pink-and-glitter-and-unicorn-dust hoopla that generally surrounds Valentine’s Day recipes. I’ve honestly never understood why Valentine’s Day food always looks like Cupid puked a sparkly pink rainbow all over it. What happened to the understated, simple, “I-love-you-and-I-don’t-need-pink-glitter-to-say-it” kind of romance? (Too cynical? Eh, well). There’s something about the different textures of chocolate here that I just find so lovely. The chocolate itself – even though we’re using two different flavors – is all the same color, but the layering makes sure that every piece still stands out. Aside from the letters, these berries look pretty ordinary – but once you bite into them, you get just a hint of mint (POETRY) that really takes these “ordinary” chocolate strawberries over the top. But I promised I’d show you how to make these script letters! Print out this printable (or print your own word/font combo). Cover it with wax paper. Put whatever melted chocolate remains after you’ve dipped all your berries into a piping bag (or use a plastic bag and snip a tiny bit of the bag’s corner off to make a piping bag). 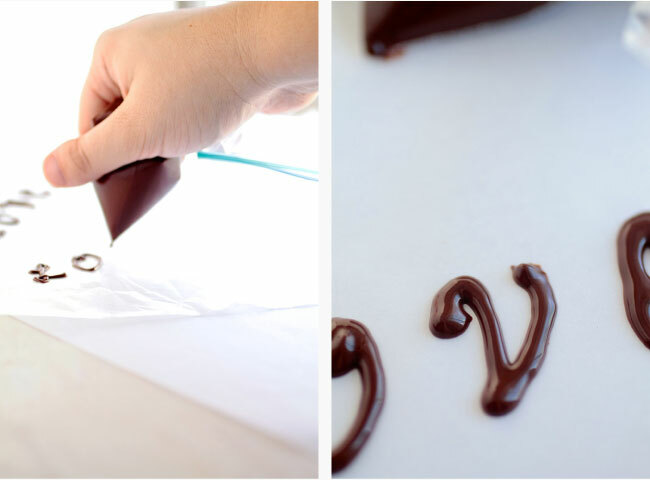 Trace the letters with the piping bag, then let the letters cool on the wax paper until the chocolate is solid. Let the rest of the chocolate set and pat yourself on the back for being so artsy. Pro tip: try not to touch the front of the chocolate letters, because you might leave a fingerprint that messes up the smooth face of the letter. Try to use one finger to pick up each letter by the back and gently place it on the strawberry. You can do it! I believe in youuuuuuu. And BOOM. You’ve just choco-tized love and put it on a strawberry. Please proceed to join me in a victory dance and then stuff yourself silly with these chocolate strawberries. 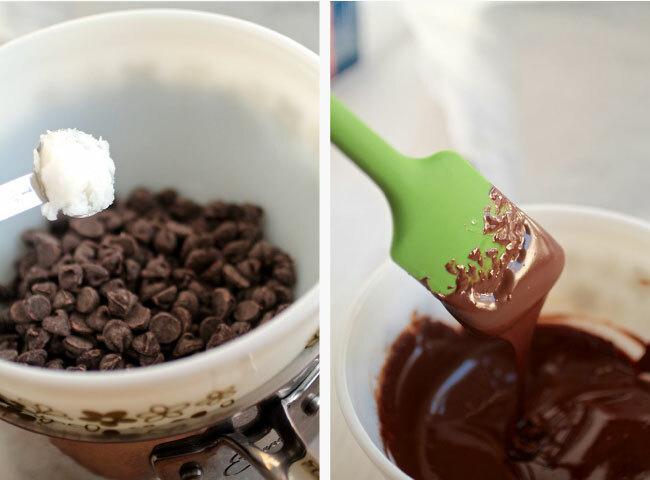 Melt semi-sweet chocolate chips and coconut oil together over a double boiler. Stir frequently until chocolate is smooth and all chips have melted, about 10 minutes. Be careful not to burn the chocolate – melt it slowly and stir gently for best results. 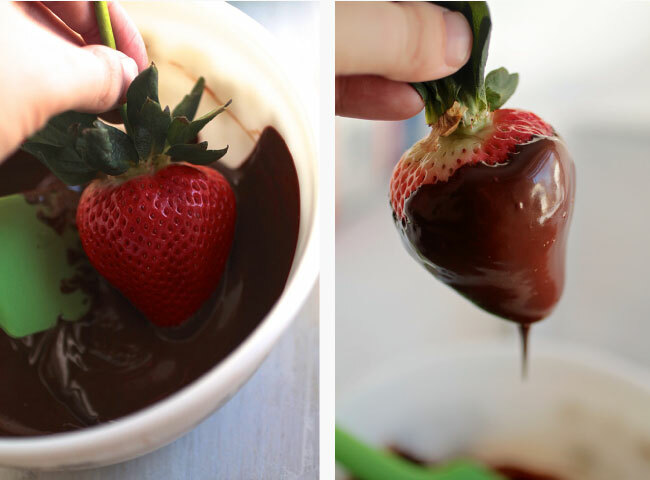 When chocolate has melted, remove it from the heat and start dipping your strawberries! 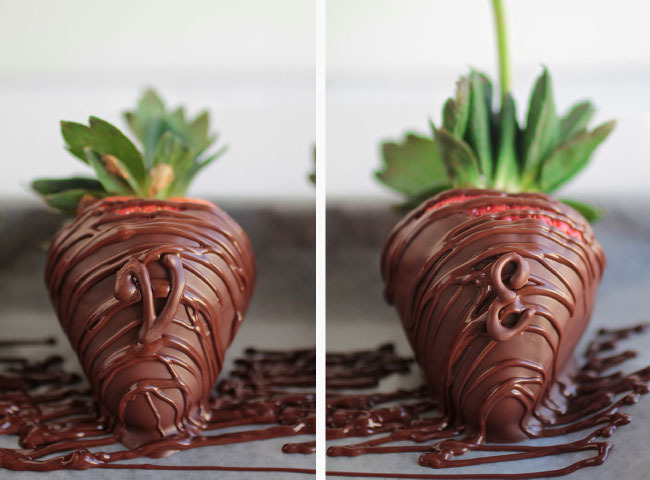 I like to dip strawberries into the chocolate at a bit of an angle, then twist them around in the chocolate so nearly all of the fruit is coated. 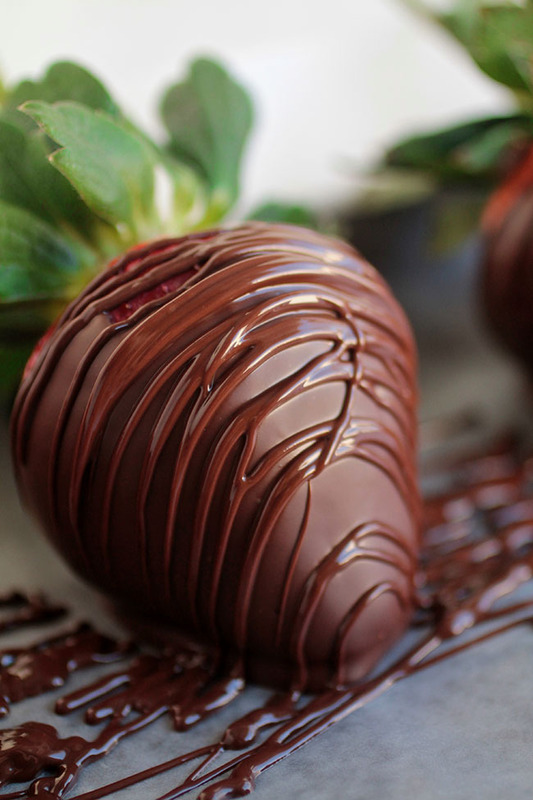 When strawberry is fully coated in chocolate, lift it out of the bowl and let any excess chocolate drip off. Place chocolate covered strawberries on your wax paper-covered baking sheet to set. 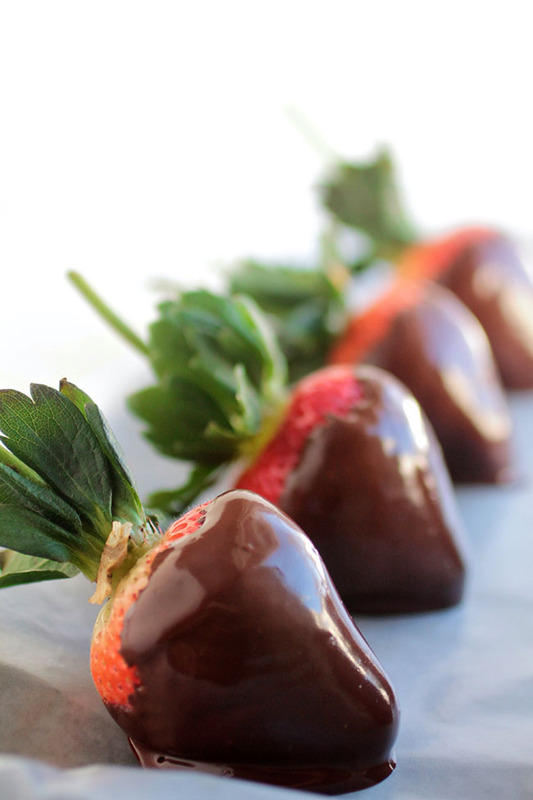 Repeat until all strawberries have been dipped in chocolate. 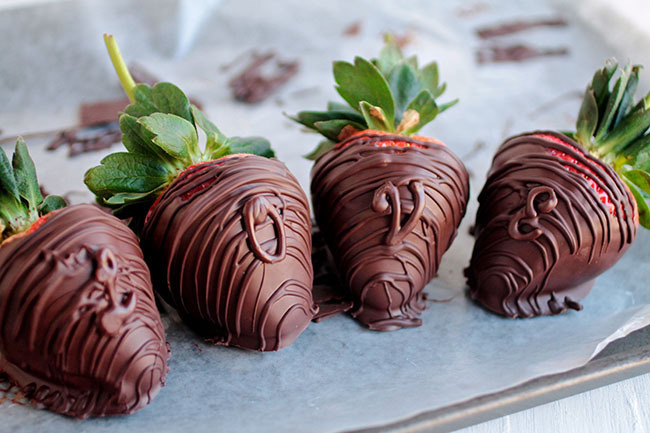 Let chocolate strawberries set on the counter while you make the chocolate letters. Cover your “LOVE” printout (or print your own text!) with a piece of waxed paper. Spoon any remaining melted semi-sweet chocolate into a small ziploc bag (or a piping bag fitted with a small circular tip). Snip off a tiny bit of the corner of the ziploc bag to turn it into a piping bag. Use the piping bag to trace the letters on your printout (you’ll be able to see them through the wax paper!) with the chocolate. No worries if you mess up on a letter or two – just pull the wax paper over so that the printed letters are under a fresh, chocolate-free area of the wax paper and try it again! I usually pipe four or five versions of the same word on a single piece of wax paper before I have enough letters I’m happy with. Set the piped chocolate letters aside to set on the counter. Let letters and strawberries set for about an hour, until chocolate is completely cooled. When chocolate strawberries have cooled, it’s time to add the mint chocolate decoration! Melt mint chocolate chips in a double boiler, stirring frequently, until smooth. When chocolate is melted, remove from heat and let cool 3-5 minutes (just long enough so that it won’t burn you through the piping bag! Chocolate should still be smooth and melted). Pour chocolate into a small ziploc bag (or a piping bag fitted with a small circular tip) and snip off a corner of the ziploc bag just like we did earlier. Use piping bag to drizzle mint chocolate back and forth in smooth, horizontal strokes across each chocolate-covered strawberry. Gently peel chocolate letters one at a time off the wax paper. Try not to touch the front of the letters, so as to avoid fingerprints on the final product. I find it’s pretty easy to peel the letter off the wax paper just like a sticker, and pick it up by its back with just one finger. You could also use tweezers or a butter knife if you want to be a bit more precise. Gently lay each chocolate letter in the center of a strawberry. The mint chocolate drizzle should still be wet and will act like glue, keeping the chocolate letter attached to the strawberry. Once you’ve adhered all the letters to strawberries, let berries set on the counter until mint chocolate has cooled. Serve immediately or store in the fridge for 3-4 days. I add coconut oil to the semi-sweet chocolate to make it a little thinner and a little glossier, which makes it easier to dip strawberries into it and have them come out smooth and even-looking. I don’t add coconut oil to the mint chocolate because we’re piping that onto the berries and we have a lot more control over what it looks like, so we don’t need the assistance of the coconut oil as much. You can absolutely add 1 tsp of coconut oil to the mint chocolate if you want to, though! You do amazing things to your food in creativity. Love it! 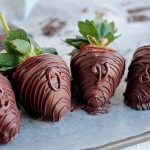 This really is made for your blog, a recipe for chocolate covered strawberries. And I like the minty addition! 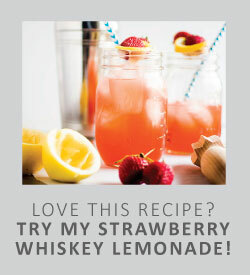 Those letters are adorable and seem easier than they looked originally when I saw the recipe. Thanks, Kaylin! The letters look swanky but are totally easy! I love piping chocolate for decorations.